This was a FuN cake to make for a fun bride and groom. Her favorite (as mine) movie is "Because I Said So" and she was very inspired by a black and white poke-a-dot trapezoid cake….but her colors were green and purple. Round one: Bake cakes. I packed each tier to match the fondant. Top and bottom tiers were key lime with green color gel and the middle tier was pineapple with purple color gel…fun right! Both had white vanilla butter cream fillings. Round two: Freeze cakes. The cakes were wrapped tightly and frozen for 24 hours. I took the cakes out, unwrapped them, and let them sit out for 20 minutes or so…to get rid of the condensations from the wrapping. I used a large and sharp bread knife to carve the angle of the cakes. As long as the cakes hadn’t defrosted all the way…carving will go smoothly. Round three: Wrap and decorate. I used Satin Ice fondant with color gel to tint the fondant. Round cookie cutters were used for the dots and I made ribbon roses with the extra fondant. Install plastic dowels for cake support. Comments for Catch That Groom!!!! Thank Melissa for entering the Third Cake Decorating Competition here at Wedding Cakes For You. 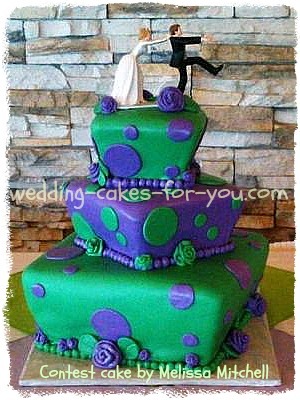 Your whimsical wedding cake is so colorful and fun. I love it! I hope it gets lots of comments and high ratings. Tell all of your friends to come and take a look! Thanks for explaining the process in which you put your cake together and I love the little tidbit at the end about having a proud moment. I think the best part about making wedding cakes is that moment when the cake is safely set up and looking gorgeous for all to enjoy at the reception. This is a great cake. It speaks of fun and energy. This is a great idea for a fun spring wedding.